'''Grand Theft Auto: San Andreas''' is a [[Rockstar North]] developed [[GTA III Era]] game, and so has references to storylines and characters from both [[Grand Theft Auto III]] and [[Grand Theft Auto: Vice City]]. It is the only game so far set in the fictional state of [[State of San Andreas|San Andreas]], consisting of three cities: [[Los Santos]], [[San Fierro]] and [[Las Venturas]], and includes vast expanses of countryside, forests, and a desert as well as a [[Mount Chiliad|mountain]]. The game is centered around the return of [[Carl Johnson]] (also known as CJ) to his gang (the [[Grove Street Families]]), and their subsequent return to power. '''Grand Theft Auto: San Andreas''' is a [[Rockstar North]] developed [[GTA III Era]] game, and so has references to storylines and characters from both [[Grand Theft Auto III]] and [[Grand Theft Auto: Vice City]]. It is the only game so far set in the fictional state of [[San Andreas in GTA III Era|San Andreas]], consisting of three cities: [[Los Santos in GTA III Era|Los Santos]], [[San Fierro]] and [[Las Venturas]], and includes vast expanses of countryside, forests, and a desert as well as a [[Mount Chiliad in GTA III Era|mountain]]. The game is centered around the return of [[Carl Johnson]] (also known as CJ) to his gang (the [[Grove Street Families]]), and their subsequent return to power. Five years ago Carl Johnson escaped from the pressures of life in his hometown, Los Santos, San Andreas. Now, it's the early '90s, and he's got to get back home. His [[Beverly Johnson|mother]] has been murdered, his family has fallen apart and his childhood friends are all heading towards disaster. On his return to the [[Grove Street|neighborhood]], a couple of corrupt cops frame him for the homicide of a [[Ralph Pendelbury|police officer]]. CJ is forced on a journey that takes him across the entire state of San Andreas, to save his family and take control of the streets. San Andreas is similarly structured to the previous two games in the series. The core gameplay consists of elements of a third-person shooter and a driving game, affording the player a large, open environment in which to move around. On foot, the player's character is capable of walking, running, swimming (the first GTA game in which diving is possible), limited climbing and jumping, as well as using weapons and various forms of hand to hand combat. Players can operate a variety of vehicles, including automobiles, boats, airplanes, helicopters, trains, tanks, motorcycles and bicycles. Players may also import vehicles rather than steal them. CJ is Grand Theft Auto's most customizable [[Protagonist|protagonist]] due to the possibility in-game to change his clothes, tattoos, hairstyle and even his body mass in which he can be fat, skinny or muscular. *'''[[Assets in GTA San Andreas|Assets]]''' — Assets are places where you can periodically go to collect a predetermined amount of money. *'''[[Businesses in GTA San Andreas|Businesses]]''' — There are many different types of businesses featured. *'''[[Plot in GTA San Andreas|Plot]]''' — The whole plot that makes the gameworld story understandable. *'''[[Radio Stations in GTA San Andreas|Radio Stations]]''' — The radio stations heard in-game. *'''[[Restaurants in GTA San Andreas|Restaurants]]''' — See the food-chains in San Andreas. *'''[[Restricted Areas]]''' — Restricted areas such as Area 69 and The Easter Basin Naval Base. *'''Restricted Areas''' — [[Area 69]] and [[Easter Basin Naval Base|The Easter Basin Naval Base]]. *'''[[Safehouses in GTA San Andreas|Safehouses]]''' — All of the accessible safehouses and how to obtain them. *'''[[State of San Andreas|Places]]''' — Many different locations are within San Andreas, you might want to visit them all. *'''[[San Andreas in GTA III Era|Places]]''' — Many different locations are within San Andreas, you might want to visit them all. *'''[[Schools in GTA San Andreas|Schools]]''' — Information about the types of schooling offered such as the [[Pilot School]]. *'''[[Statistics]]''' — Different statistics are used to track your progress. On November 26th, Rockstar announced<ref>http://www.rockstargames.com/newswire/article/51870/grand-theft-auto-san-andreas-mobile-coming-this-december.html</ref> that much like the two games preceding it, a mobile version of GTA San Andreas would be released - the game was released for [[iOS]] on 12 December 2013, with an [[Android]] and [[Amazon Kindle]] version released on 19 December 2013 and a Windows Phone version on 27 January 2014. The mobile version featured remastered graphics, consisting of dynamic and detailed shadows, greater draw distance, an enriched color palette, plus enhanced character and car models, although a number of songs were removed from the soundtrack, presumably due to licensing issues. The mobile version was later ported to the [[Xbox 360]] on October 26, 2014, the game's 10th anniversary, replacing the Xbox Original version that was previously available, and introducing [[Achievements in GTA San Andreas|Achievements]]. * GTA San Andreas contains many references to the popular 90s Hood Film "Boyz n' The Hood". Some characters in the game are visually and/or mentally based on characters from the film, as well as some events that take place. * Somehow GTA Vice City files and beta pics exist in txd folder. The beta files consist of the beta map, beta intro and outro pictures, and beta loading screen. * Strangely, [[Grand Theft Auto: Vice City]] beta elements can be found in the files. The beta files consist of the beta map, beta intro and outro pictures, and beta loading screen. These may be leftovers from Vice City. * GTA San Andreas is also the first Grand Theft Auto to include many features, such as customizing [[Carl Johnson]] in many ways (Clothes, Tattoos etc), ability to go to the gym and gain muscle, and the ability to go on dates with girls, and also have '[[Hot Coffee]]'. * In the top right frame on the cover of the game, a street sign saying Grove Street / Glen Park is shown, implying the two streets intersect. In the actual game, the two streets are in different parts of the city. * The protagonist of [[Bully]], Jimmy Hopkins, was born around the time GTA San Andreas takes place. * Famous author [[wp:Stephen King|Stephen King]] mentioned Grand Theft Auto: San Andreas while speaking out against HB 1423, a bill pending in the Massachusetts state legislature that would restrict or ban the sale of violent video games to anyone under the age of 18. 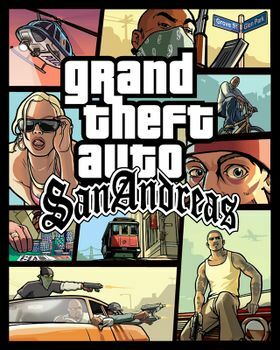 King stated at one point: "''...it would forbid a 17-year-old, legally able to see [[wp:Hostel: Part II|Hostel: Part II]], from buying or renting Grand Theft Auto: San Andreas, which is violent but less graphic...''" King also opined that such games reflect the violence that already exists in society, which would not be lessened by such a law, and would be redundant in light of the ratings system that already exists for video games.